The Broke and the Bookish : Daisy Asks Your Recommendations for Book Club Books! Daisy Asks Your Recommendations for Book Club Books! So I'm in a book club with Debby @ Snuggly Oranges, Daph @ Loving Books and Mel @ The Daily Prophecy and it's awesome! We get together once a month and we take turns nominated the books and then vote on which one we want to read. 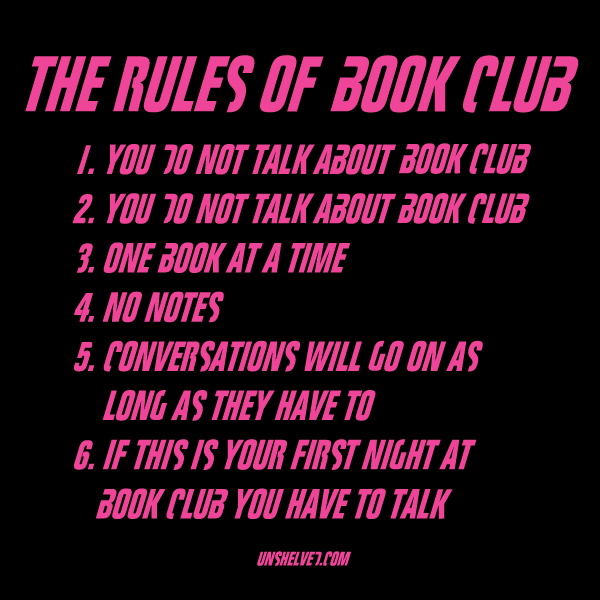 And we always try to all have read the book before we get together to have dinner and talk about the book and other books and life in general and blogging. What I wanted to ask you guys: what are some books you'd recommend for a book club? We read a lot of YA and all love fantasy. What are books that really spark a discussion? We usually go off topic pretty quickly, so if you have recommendations, please let me know! Uninvited by Sophie Jordan sparks some good conversation topics. We recently did that book in my YA book club and we had a serious chat. Ohhh Perks could lead to great discussions. Mothership by Martin Leicht & Isla Neal, Ready Player One by Ernest Cline, Among Others by Jo Walton (this one will give you a built in booklist since it's a coming-of-age novel about a girl who reads a lot of sic-fi and fantasy), Tooth & Claw also by Jo Walton (Sense & Sensibility but about a family and society of dragons), Mary Robinette Kowal's Glamour books -- regency era novels about an alternate world in which women use are taught to manipulate magical glamours to enhance or create beauty. Aside from Mothership, these are all adult novels that are accessible and readable fantasy/scifi books that based on your list above should work pretty well for your group..
Our book club rarely reads US, but my sister & I read mostly US so we try to nominate US books when it's our turn. We recently read both "Code Name Verify" & "Rose Under Fire" with great success. Also, Patrick Ness' "Chaos Walking" trilogy would be great for discussion. Stupid auto text correction-not us, but YA! I loooooved Code Name Verity! One of the best novels I've read this year! Flat-Out Love by Jessica Park and 17 & Gone by Nova Ren Suma generated a lot of conversation in my book club. We have some hit and some misses, but I would recommend these. We are are currently reading Nearly Gone by Elle Cosimano for next meeting. Good luck on choosing a book! Mr. Penumbra's 24 Hour Bookstore!!! We read that but weren't super impressed by the story. I think it was wayyy too tech-y for our tastes! Haha! I loved Code Name Verity! And, we have all read some of the same YA novels, even though we haven't actually chosen them as book club books, with books like Divergent (and our mutual hatred of Allegiant) and The Fault in Our Stars (of courseeeee). I'm not a huge fantasy reader, but there are some great YA novels that lend themselves to discussion. Hate List by Jennifer Brown is another great one that could have a lot of discussion, as well as any Laurie Halse Anderson book. The best novels we have read in book club are all adult fiction, such as Gone Girl, The Orphan Master's Son, and The Unlikely Pilgrimage of Harold Fry. Our latest novel was a historical fiction YAish novel The Museum of Extraordinary Things (main characters were teens, but it was written more for adults). Good luck! Choosing a book is always the funnest (and hardest!) part of book club! It's not YA, but I think The River of No Return by Bee Ridgway would spark some wonderful discussion. (I reviewed it here.) It blends historical novel, historical romance, mystery, and time travel fantasy - emphasis on the time travel; Ridgway explores some fascinating ideas about time and time travel. And the characters are wonderful. Great choice! One of my favorite local authors and going to an event at a local bookstore where she's signing the paperback tomorrow. I'll let her know I saw her name being bandied about (in a good way) on the internet. Since you all like fantasy, Falling Kingdoms by Morgan Rhodes. It's Game of Thrones for teens with elements of magic. Personally, I enjoy historical fiction, so Tsarina by J Nelle Patrick or Prisoner of Night and Fog by Anne Blankman. Anything with a movie coming out this year would be good. Fire by Kristen Cashore - so much to talk about I was overwhelmed by the thought of reviewing it. Also, it *can* be read before Graceling, the 'first' book, as it's a semi-prequel to it. I've chosen "The Power of One", "Come Back", "Speak" and "Attachments" for my bookclub and overall they were well received and resulted in a lot of discussion. If you want to go in a different direction, The Hundred-Year Old Man Who Climbed Out of the Window and Disappeared, by Jonas Jonasson is such a fun read! "Graceling" by Kristen Cashores. My favorite fantasy book ever. And great for a book club because you can have tons of discussion about powerful YA heroines and being true to yourself. Plus, Katsa and Po are a dreamy couple with a realistic, slow-build relationship. No love triangles or insta-love or any of that. Fantastic book. I LOVE that book! You're so right about Katsa and Po having an amazing relationship! The Little Stranger by Sarah Waters or ANY Margaret Atwood. What about Lev Grossman's "The Magicians"? It's a more serious fantasy novel with a setup that seems Harry Potteresque, but it isn't in the least. Crazy Rich Asians by Kevin Kwan is a good one. It's got a little bit of everything (contemporary) and should spark a lot of conversations. Plus it'll (eventually) be a movie. Have you guys all read The Night Circus by Erin Morgenstern or The Golem and the Jinni by Helene Wecker? What about The Rosie Project by Graeme Simsion? Or The Forgotten Garden by Kate Morton? Or anything by Jennifer Weiner or even Emily Giffin. Apparently I'm your go-to for adult fiction, haha. Good luck finding your next great pick! I second the nominations for Eleanor & Park and The Night Circus. I also think Unwind, by Neal Shusterman or Tides, by Betsy Cornwell could spark some good book club discussions. Tease by Amanda Maciel would definitely produce lots of discussion. I also agree with Two Boys Kissing... my bookclub did a lot of talking about that one. The Diviners also. My Book club just read The Fault in Our Stars (which made for an amazing discussion). We also read A Complicated Kindness by Miriam Toews- those were the best discussion books. We're now reading The Night Circus. We'll see how that goes. Oooh, great question! Some of my favorite book club reads have been The Giver by Lois Lowry, Peace Like a River by Lief Enger, and The Book Thief by Markus Zusak. If you feel like branching out, Half the Sky by Nicholas Kristof and Sharon WuDunn is a great non-fiction conversation starter!